El-ahrairah, prince with a thousand enemies! The last of that particular set (all sketched over the course of about three days), colored. Also my first submission in the fanart section. 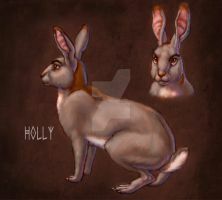 Third creature, inspired by Watership Down. Which apparently was my favorite book in grade school. After re-watching the movie this summer, it's a wonder I didn't grow up deranged. Heavy stuff! When I first saw this I thought: "Hmm... looks like some kind of rodent." And then I read your description and was like "OF COURSE IT´S EL-AHRAIRAH, what else??" 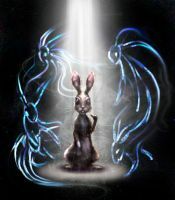 I adore the book, the lore and everything about Watership Down. It´s so down-to-earth and mystical at the same time. I used to watch the kids show when I was little you know, the tame, nice one without any blood. And then I stumbled over the real movie, thinking it was my series, and had nightmares for weeks. ^^° I read the book when I was older and loved it, and also rewatched the movie. It´s just wonderful. Not meant for children, but wonderful. Great job on that interpretation of the father of all rabbits! what animal is it, if any? looks like a hare. Yes! Exactly what I was going for. if they catch you they will kill you, but first they must catch you. if thats prey, what do the predators look like ? A very unique and awesome version of El-ahrairah . I've never quite seen anything like it, wonderfully done! Creepy. o_O But AWESOME! Nice work. Gorgeous! My fiance actually finally got me to read this book last year. I loved it. And this is just breathtaking. it reminds me of old folklore art. Ah, I'm glad you enjoyed the book! And thank you. I was very inspired by the opening of the animated version of Watership Down, which might be worth checking out on youtube if you enjoy folklore-type art. 's a well done opening. hmm I just may. I've never actually seen the movie. My fiance has. He used to own it but had it stolen while at work (he worked in an Assisted Living Home and he's not sure if a Client or a fellow Care Taker stole it) I do want to see it though. maybe I'll check it out on YouTube! this just absolutely blew my mind. not only do I love the movie, but the beginning sequence telling the story of El-ahrairah is some of the most fascinating animation ever created, let alone by Disney. And what an amazingly intimate rendering of him. Detailed but somehow vague, as myths should be. Watership Down seems to have such a small fan base, so I'm glad to hear such a thing from a fan of the movie. Thank you, I'm pleased you approve of my rendition of him! this is cool, creepy, disturbing, dynamic, and all in all a job well done! Thank ya! 's a good movie...though vaguely disturbing. That part with the badger(I think) in the bushes was terrifying! well, not for me, but I imagined it in the minds of kids. I mean, it IS a kid's movie. *giggles* man those kids must have screamed at that part lol. Such a wonderful rendition of this character. I especialy looove the ears! ...no fluffy bunny tail? I supose that wouldn't look very Godly. And nah, I'd imagine not. Tempting to draw, though! You made him look awesome! This is great! I'm responding so late, but thank you very much! I haven't actually read Watership Down, but I've seen snippets of the movie. Definitely a bit bothersome! I just love the way you detail your stuff--seriously, it's just so good. Amazingly beautiful, really captures the aura and essence of the character in the book: if it was the design of El-ahrairah in a photorealistic CGI Watership Down remake, I'd love it!!! Photorealistic CGI Watership Down remake? This really rocks. Solid design, and really clean finishing style! HANDS ARE FOR THE WEAK. But thank ya, glad you think it turned out clean! Whew, glad I have the approval of a fellow reader! Though honestly I haven't a clue where my copy of the book went. Gots to find'n re-read it, aghhh.